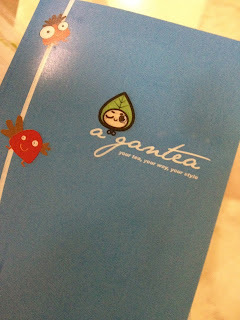 Milk Tea Escapade: A Gantea | Vanity and Everything in Between. Last Saturday, Lawrence and I had our usual Saturdate. We had dinner at Sugi then watched Snow White and the Huntsman. 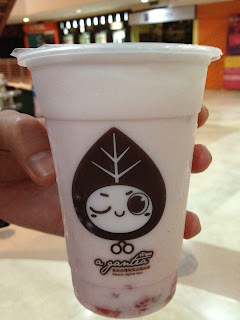 Before going to the cinema, we went to A Gantea to try their milk tea. I wasn't able to take photos inside because we were in a hurry. Lawrence has Strawberry Milk Tea while I had their premium A Gantea Milk tea or something like that. 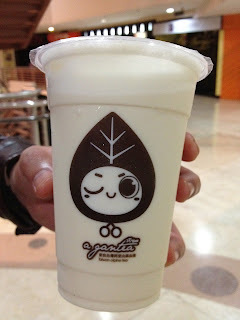 I've tried a lot of milk teas and A Gantea has got to be the one that I least like. Actually, I don't like it at all. It doesn't taste good. It's probably the kind of tea that they use which makes it taste really sucky. You can' really taste the tea in strawberry milk tea and it's rather too sour in Lawrence's opinion. That is in comparison with Chatime and Serenitea's strawberry milk tea. The price is at par with Chatime's price. Medium size is PhP75 and large is PhP85. I ordered their premium milk tea which I assumed is the usual milk tea. But gah, it tastes to bad. I only drank about 1/4 or the cup and I was forcing myself to drink it. It tastes weird. I don't think I'll try A Gantea again. Besides there are other milk tea chains in Greenbelt - Glorietta area. A Gantea is located in between Greenbelt 1 and 2. I love milk tea! My fave is taiwanese kind.